To change the steering wheel angle, pull up on the lock release (located beneath the steering column), adjust the steering wheel to the desired angle, then release the lock-release to lock the steering wheel in place. The steering wheel should be positioned so that it feels comfortable to you when driving, while permitting you to see the instrument panel warning lights and gauges. Never adjust the position of the steering wheel while the vehicle is in motion, or you may lose control of the vehicle. 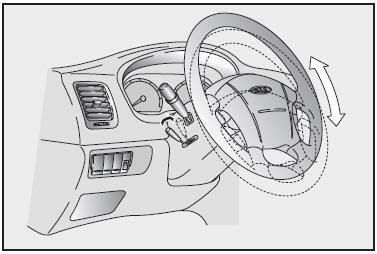 After adjusting, push the steering wheel up and down to be certain it is locked in position.